FOURTEEN: Open letter. – Folks, whack 'em. One day, my friend Adam told me the most bizarre story. Poor guy just wants to go to that taco place. 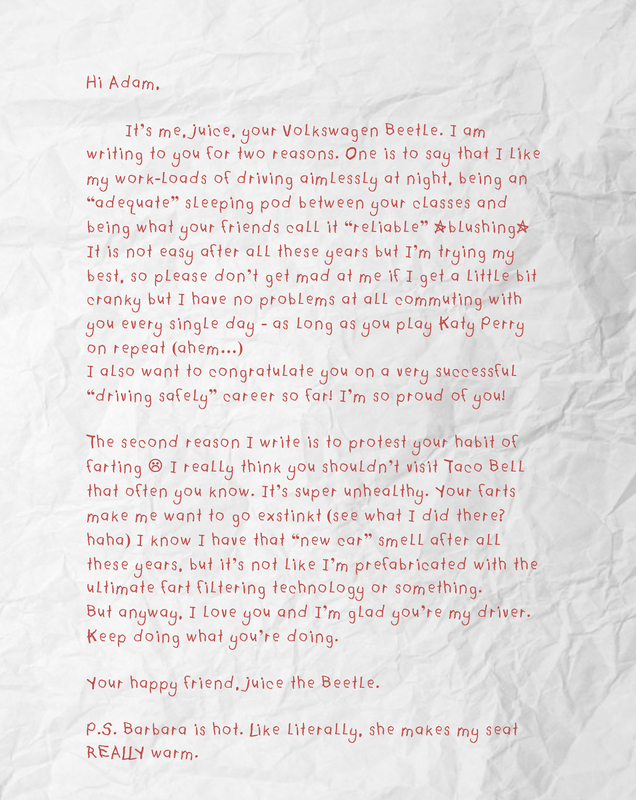 But when he gets to his car, he finds a letter – signed from Juice, his Beetle. Juice reveals the most personal things that I didn’t even know about Adam! I didn’t know he likes Katy Perry?! And I totally knew that wasn’t a rotten broccoli smell! And that he likes to drive aimlessly at night? Well… This explains a lot. THIRTEEN: Do you believe in magic. Genaldri, This is a funny, clever, and imaginative concept. Keep exploring and challenging yourself as you move forward through Project 54. Well done. I agree with VAUGHNCM2. This post was great. It was so fresh and entertaining. I’ve tried to do something similar on my blog, but my stories haven’t come out as clean as yours. I like the crinkled note effect, it made it seem very real. Hahahaha this is good man, really funny (especially the bit about Barbara). It’s cool how you highlighted the bond between a person and their car from the car’s perspective.